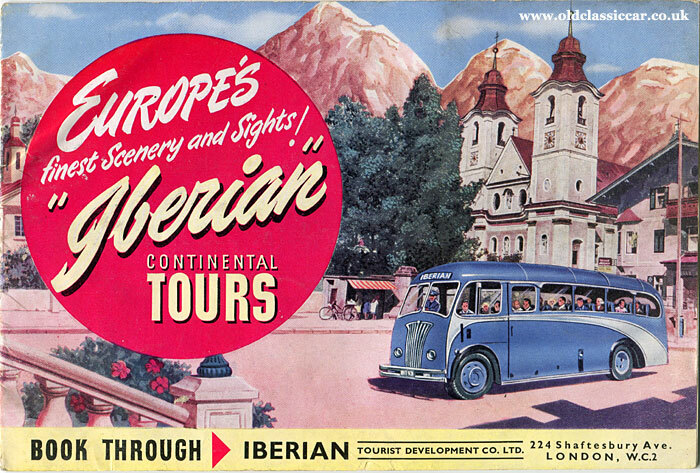 Iberian Tourist Devt Co. & Blue Cars motor-coach tours for 1950. Homepage. This page: Tours to and around Europe with Blue Cars Ltd & Iberian Tourist Development Company. European motor-coach tours for 1950. 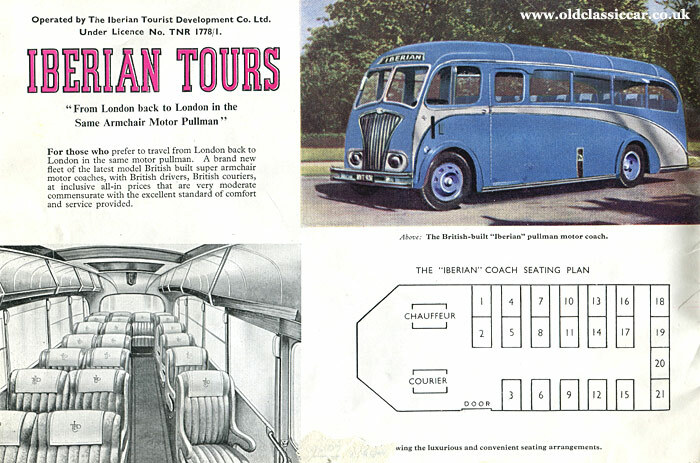 Luxury coach tours were a popular method of touring Europe either side of WW2, as the various booklets produced by tour companies that feature in this section of OCC will attestify to. 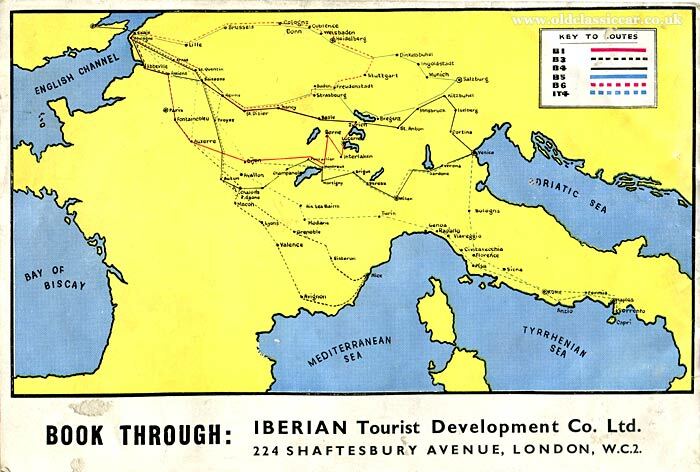 The following booklet is for the 1950 coach tour season, and specifically describes the pan-European trips organised by the Iberian Tourist Development Company Limited, under the title of "Iberian" Continental Tours. The cover features an illustration that includes a tantalising glimpse of a recently-purchased "Iberian" motor pullman, one of a fleet of such vehicles that the company had purchased. Inside the front cover is another illustration of a coach, along with a drawing that reveals its sumptuous interior fittings and a seating plan, where there was space for 21 passengers, the driver ("chauffeur") and the tour guide, or "courier". Clearly, any trip aboard one of these new coaches would be a luxurious affair. I'm unable to find any reference within the booklet to who built the coachwork or provided the chassis beneath it. The reader is warmly invited to consider the route options offered as part of the Iberian Tours itineraries ... less than five years after the war had come to an end. "HERE is the answer to your holiday question! Here is the "ideal" in holidays .... supreme enjoyment and perfect comfort .... from glorious beginning to regretful end! Iberian Tours offer you a holiday without equal .... nothing has been overlooked in making sure that the Iberian passenger is free to enjoy every minute of his or her "holiday of a lifetime."" "Simply choose your Tour - there is one to suit everyone; reserve your individual armchair seat .... and, on the day of days, as you join the superb Iberian coach in London, you can relax and look forward to a really great time until the same coach brings you back again to London ...."
"Comfort all the way .... with all the delights of Europe's Wonderland yours to enjoy in the most trouble-free holiday ever devised. This year - go Iberian!" Regarding the very sleek motor-coaches used on their routes, the following glowing description is given. "THE NEW "IBERIAN" MOTOR PULLMANS are absolutely the last word in streamlined elegance with the most comfortable armchair seating ever devised for road travel. Individual fauteuils set in pairs and singles provide just that right comfortable lounging support you have dreamed about. Not so high at the back that visibility is obstructed, they are tastefully upholstered in fawn moquette with plenty of leg space and foot support. Wide safety-glass windows and complete forward visibility due to the absence driver's cab or bulkhead. The usual accessories, ashtrays, hold-all, are attached to the back of each seat. Luggage racks, air conditioning and loud speakers to relay the courier's commentary whilst en route. The body space normally accommodating 33 passengers is limited to 21 seats. The powerful diesel engine is fitted with dual gear box to enable fast speeds being maintained and for extra safety heavy duty "Dewandre Servo" braking has been fitted." Tour B1 was a fourteen-day trip to Switzerland and back, passing through Reims and Nancy to Basle, Zurich, Lucerne, Interlaken and Montreux, calling in at Autun and Amiens on the return leg. The price per passenger was 55 Guineas. Tour B3 headed off to the French and Italian Rivieras, while B4 headed via France and Switzerland to Venice and to the Dolomite mountains. The coach assigned to Tour B5 was set to visit the Black Forest with its passengers, while IT4 was a 21-day excursion to Italy. B6 was an alternative run down to the Black Forest, curiously no details for B2 are given so perhaps it had been removed following the 1949 season. The rear cover gives a route map. Book with Blue Cars (Continental) Limited. Bookings could be made direct with the operator, the Iberian Tourist Development Company Ltd of Shaftesbury Road in London, or else with an appointed sales agent. This particular booklet, plus another, had been issued by agent Blue Cars (Continental) Limited to a potential customer. 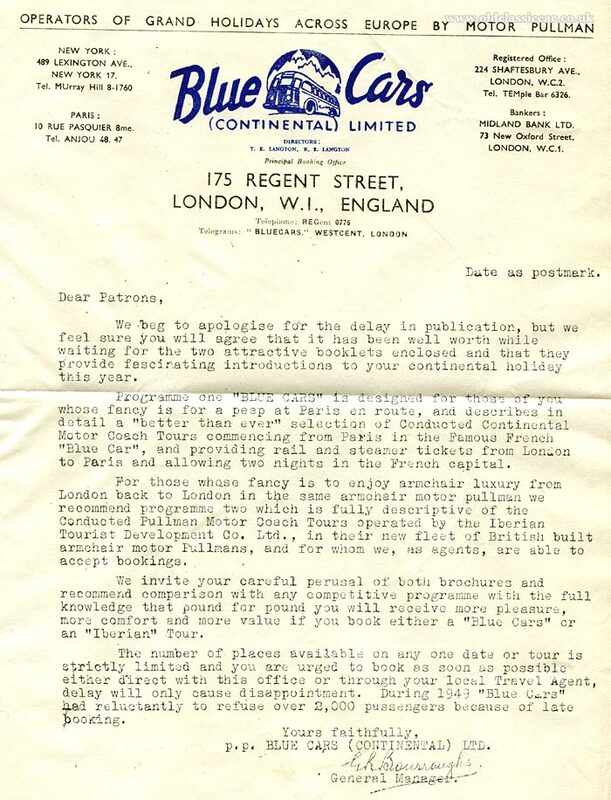 One booklet (which I don't have) described a series of "BLUE CARS" Conducted Continental Motor Coach Tours running out of Paris, which would be reached by rail and steamer tickets from London. The second booklet, this one, was designed for anyone seeking "armchair luxury from London back to London in the same armchair motor pullman". Early booking was advised.